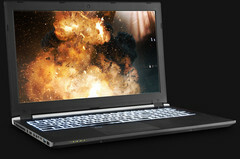 American computer manufacturer System76 has offered the company’s updated Oryx Pro for pre-order. For US$1,599, the buyer would receive a 15.6-inch, Ubuntu-based laptop sporting an i7-8750H processor, Nvidia GeForce GTX 1060 GPU, 8 GB RAM, and a 250 GB M.2 SSD. The official System76 website offers a generous amount of configurations for the Oryx Pro update. System76, a computer-hardware maker based in Denver, has made the updated Oryx Pro available for pre-order. The latest edition to the company’s line-up had already been teased in a dramatic trailer that would not have looked out of place promoting a thriller movie. The Oryx Pro can be configured with either Ubuntu 18.04 LTS (64-bit) or Pop!_OS 18.04 LTS (64-bit) as operating system. The base system has a starting price of US$1,599, but there are lots of options available for those who like to customize their laptop of choice. Along with the hexa-core Coffee Lake i7-8750H processor, it is possible to choose between a GeForce GTX 1060 and GTX 1070 (the latter bumps the price up by US$249). Up to 32 GB RAM can be ordered, and there is an option to have up to a 2 TB M.2 SSD installed. However, playing with the website’s configurator can pull up some very expensive variants. For example, the Oryx Pro with i7-8750H, GTX 1070, 4K display, 32 GB RAM, and 2 TB SSD will set you back a whopping US$3,031. System 76 states that shipping will begin in late May, and there is a free movie poster for those among the first 100 pre-orders. 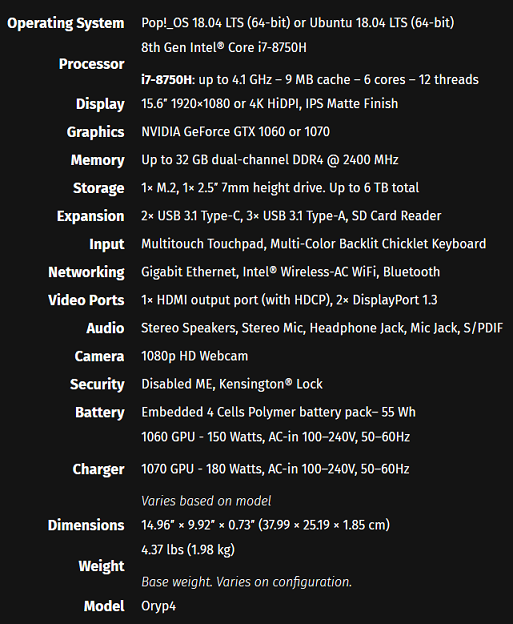 Full specifications for the Oryx Pro can be seen in the image below.